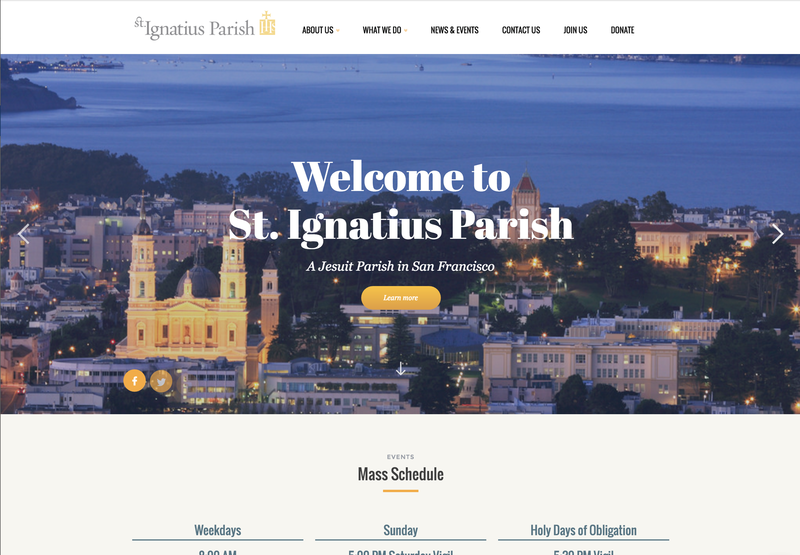 I'm pleased to announce that St. Ignatius has a brand new website. You're likely reading this article on it now! The site has a number of upgrades and improvements over the previous site. Overall Look and Feel: The entire site has a modern look and feel to it, complete with full width images, a responsive design to showcase the site on mobile and tablets, and more. Events: Events are better displayed across the home page and in a new events section. When you click into an event, you'll now be able to RSVP through eventbrite right from the event itself. Calendar: For recurring events that don't need an RSVP page, the entire Parish calendar is now viewable right from the home page. Design: Pages have custom designs to best fit the content that is present on them. In most instances, text-heavy pages on the old site have been re-imagined to include images, and intelligent break points within pages to make content scannable. The base paragraph font has also been enlarged to make readability easier. The font palette was chosen to complement and accentuate the stunning architectural design of the St. Ignatius itself. People: Key people and their contact information is now findable on appropriate pages as well as a new global People page that lists all Parish leadership, staff and commission members. Future Proof: The site was designed and built to be upgraded over time as the needs of the Parish evolve and new capabilities are needed. Thank you to everyone who viewed early versions of this site and provided detailed feedback and edits. Not every suggestion was incorporated exactly as requested, but all were given their due consideration, and many may yet be included in future updates. Building a house is a type of project where the project eventually gets to a point of being "done." On the other hand, when building a website you never actually get it "done"; only "done for now." In that spirit, we fully plan to continue building, refining and upgrading this site and its capabilities over the weeks and months to come. Though I was the one who did most of the work to build the site, none of it would have happened without the efforts of a number of people. A special thanks goes out to Fran Quinn van Bergen for championing the effort to launch this project, to Fr. Greg Bonfiglio for his support of the project and the design direction, and to Gary Price for bringing the necessary stakeholders together as well as his numerous efforts to edit page content and document bug fixes.